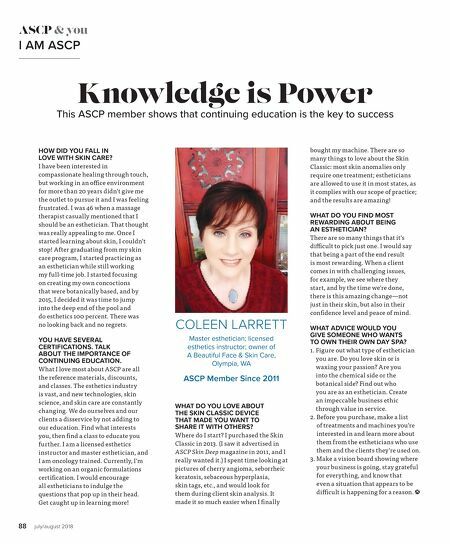 88 july/august 2018 ASCP & you I AM ASCP Knowledge is Power This ASCP member shows that continuing education is the key to success HOW DID YOU FALL IN LOVE WITH SKIN CARE? I have been interested in compassionate healing through touch, but working in an offi ce environment for more than 20 years didn't give me the outlet to pursue it and I was feeling frustrated. I was 46 when a massage therapist casually mentioned that I should be an esthetician. That thought was really appealing to me. Once I started learning about skin, I couldn't stop! After graduating from my skin care program, I started practicing as an esthetician while still working my full-time job. I started focusing on creating my own concoctions that were botanically based, and by 2015, I decided it was time to jump into the deep end of the pool and do esthetics 100 percent. There was no looking back and no regrets. YOU HAVE SEVERAL CERTIFICATIONS. TALK ABOUT THE IMPORTANCE OF CONTINUING EDUCATION. What I love most about ASCP are all the reference materials, discounts, and classes. The esthetics industry is vast, and new technologies, skin science, and skin care are constantly changing. We do ourselves and our clients a disservice by not adding to our education. Find what interests you, then fi nd a class to educate you further. I am a licensed esthetics instructor and master esthetician, and I am oncology trained. Currently, I'm working on an organic formulations certifi cation. I would encourage all estheticians to indulge the questions that pop up in their head. Get caught up in learning more! WHAT DO YOU LOVE ABOUT THE SKIN CLASSIC DEVICE THAT MADE YOU WANT TO SHARE IT WITH OTHERS? Where do I start? I purchased the Skin Classic in 2013. (I saw it advertised in ASCP Skin Deep magazine in 2011, and I really wanted it.) I spent time looking at pictures of cherry angioma, seborrheic keratosis, sebaceous hyperplasia, skin tags, etc., and would look for them during client skin analysis. It made it so much easier when I fi nally COLEEN LARRETT Master esthetician; licensed esthetics instructor; owner of A Beautiful Face & Skin Care, Olympia, WA ASCP Member Since 2011 bought my machine. There are so many things to love about the Skin Classic: most skin anomalies only require one treatment; estheticians are allowed to use it in most states, as it complies with our scope of practice; and the results are amazing! WHAT DO YOU FIND MOST REWARDING ABOUT BEING AN ESTHETICIAN? There are so many things that it's diffi cult to pick just one. I would say that being a part of the end result is most rewarding. When a client comes in with challenging issues, for example, we see where they start, and by the time we're done, there is this amazing change—not just in their skin, but also in their confi dence level and peace of mind. WHAT ADVICE WOULD YOU GIVE SOMEONE WHO WANTS TO OWN THEIR OWN DAY SPA? 1. Figure out what type of esthetician you are. Do you love skin or is waxing your passion? Are you into the chemical side or the botanical side? Find out who you are as an esthetician. Create an impeccable business ethic through value in service. 2. Before you purchase, make a list of treatments and machines you're interested in and learn more about them from the estheticians who use them and the clients they're used on. 3. Make a vision board showing where your business is going, stay grateful for everything, and know that even a situation that appears to be diffi cult is happening for a reason.